In light of recent political discourse in America, the growing divide between Republican and Democrat values has slowly been growing. This brooding distemper has even pulled books into the crossfire. J.K. Rowling’s recent and past comments on Donald Trump have ignited Trump supporters in the community: some examples include Trump being racist, authoritarian, misogynist and believing in eugenics. Rowling’s comments raised the attention of many Trump supporters. Either out of spite or as a way of showing defiance to Rowling’s ideals, some showed their disapproval by burning her books. However, it is a bit interesting to think that Rowling’s books have anything to do with American politics. The gesture starts to look like a way of offending Rowling rather than sharing valid reasons to their own thoughts. Of course, Rowling responded in a comedic fashion. The Harry Potter author didn’t react with personal disappointment. Rather, she pointed out the fact that she still has the profit made from the book sales. The tweet makes the supporters look like they should be shamed instead. From a more holistic perspective, these kind of events start to question the connection between the writer and their creations. Does the writer’s outside beliefs affect our enjoyment of a book even if it may have nothing to do with those beliefs? 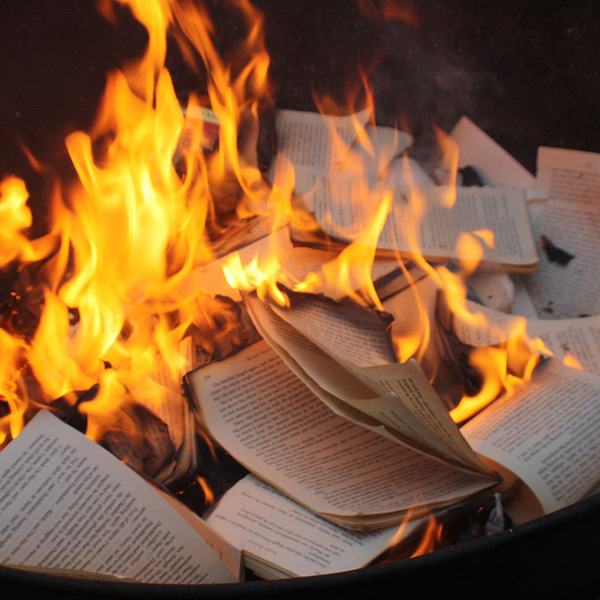 Should books be thrown into the line of fire to show discontent? With a capitalistic point of view, yes – burning the books can be a way of reducing further exchanges. You can’t sell or distribute books that are destroyed. Conversely, the author still retains the profits from the person buying the books in the first place. It becomes a difficult and complex issue to confront. As food for thought, here is a video about why Nazis burned books in the past. How can this event be similar? How can it be different? Perhaps its purpose now is for a more noble cause. Perhaps not. Tell us what you think!